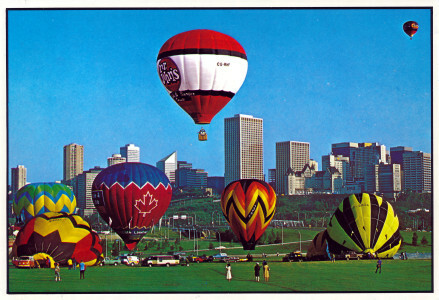 For the last year or so I have been collecting various postcards and images from Edmonton’s past. My collection isn’t that wonderful or anything but I have some neat pictures nonetheless. Since my favorite thing is to do a comparison between then and now, I will also include some Google Earth or Streetview images. 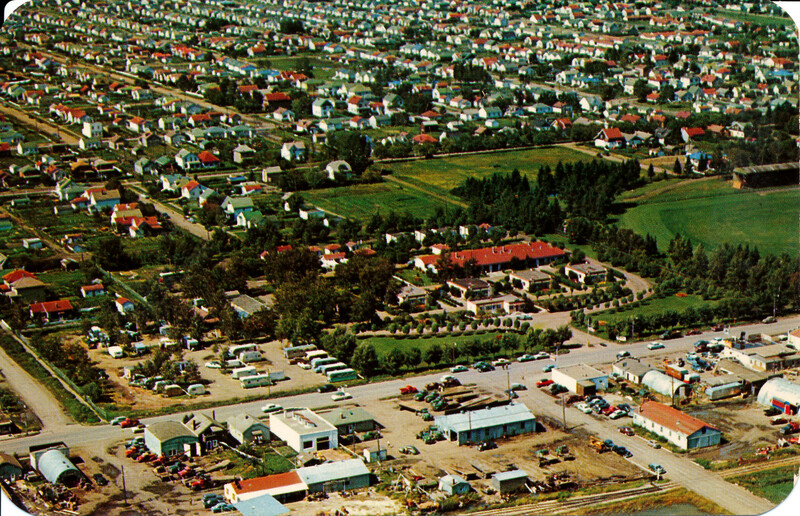 This is an aerial view looking at what was the Edmonton Auto Court. The postcard doesn’t specify a year but I can only assume it’s sometime before 1953. What we are looking at is 104st southbound going left to right. 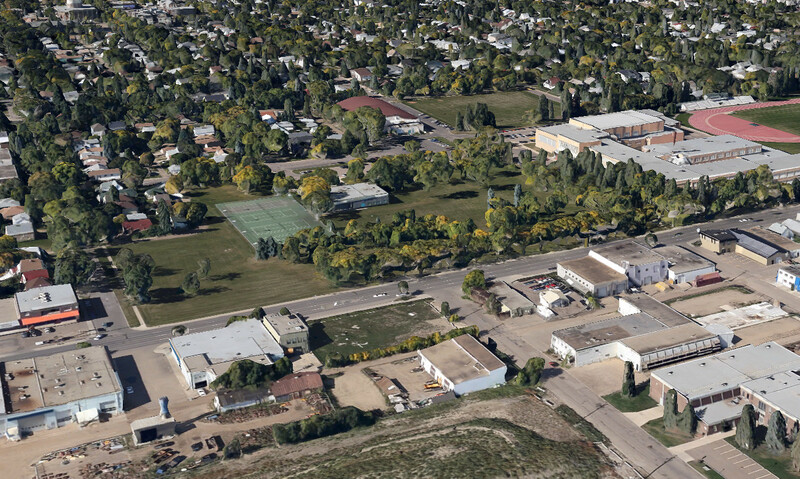 Where the subject is, the auto court is now where a part of the Scona High School sits. Scona High School was built in 1955 so this was quite some time ago. The little road on the left hand side is 70th Ave. Many of the houses are still there. I tried to get the view as close as possible but it’s not always possible to change the field of view to match. As you can see, most of the buildings have been torn down except what appears to be an old shack in the bottom left hand corner of the original. It’s interesting to me because I used to work for the company that grew out of that building. It was called Micro Machine. Also, many of the houses in that area are exactly as they were from that time but the colors have faded significantly. Also, you can spot the remnants of the train tracks that used to run along that path. As far as I know they were moved in the late 70’s. This is a view of the Legislature grounds from some time in the 50’s. 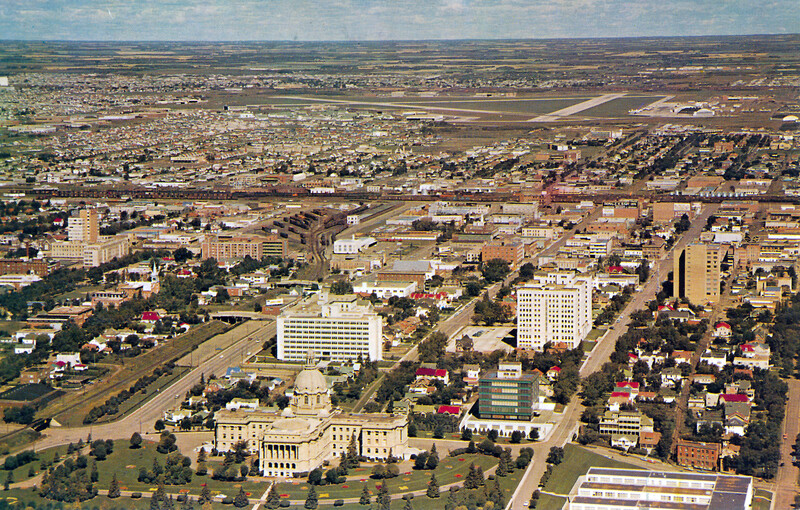 As you can see there is a large building in the bottom right that has been torn down and the auxiliary building that sits on the Legislature grounds is substantially shorter than it is today. There have been a huge number of changes to this area in the last 60 years. 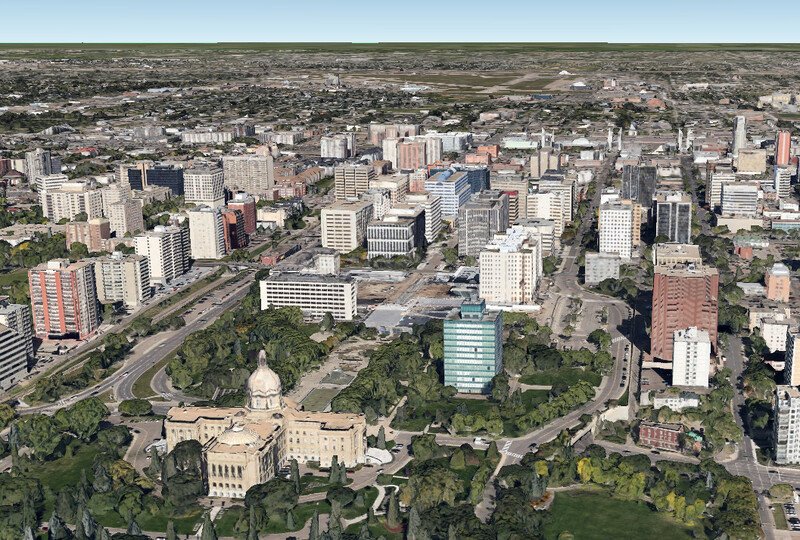 A Google earth view from 2014. Tons of changes. As you can see we have a great many more trees, or older larger ones at that but we have ripped up the tracks that used to run along 109st and there are more government buildings. This is the Hotel MacDonald as drawn in 1915. In the 50’s they added an auxiliary building which didn’t match the style or grandeur of the original building. It was called ‘The MacDonald Hotel and the box it came in’. 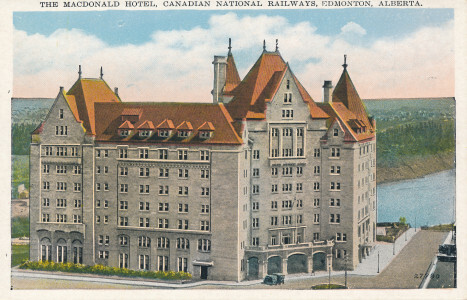 They later demolished the extra building and restored the hotel to its former glory. 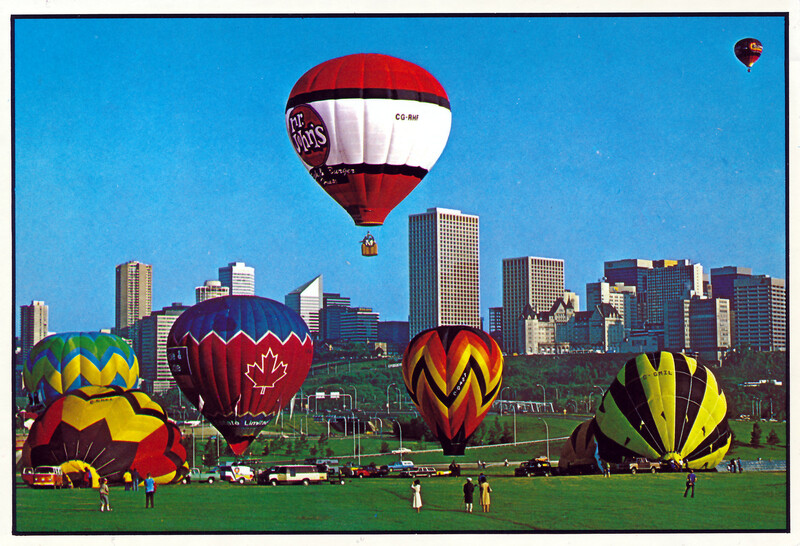 This is from a postcard from the late 1980’s as far as I can tell. You can tell simply by the super saturation of the photo. Also, there was a truck stop on the south side of Edmonton on Calgary Trail called ‘Mr Johns’. I believe it closed down in the late 2000’s due to the construction of a bypass route which decimated the businesses in that location. Anyways, I hope people enjoy these as I have many, many more to post. I may try to research the images a bit more closely and give some history on them. I like your Postcards from the Past, especially the “Then and Now” comparisons, and I’ve put a link to your site on my Facebook page. I live in the block of apartment buildings (69th-70th Ave / 105-105A Street) near Strathcona Composite, and I’m fascinated by the changes in the neighbourhood over the years. Keep ‘m coming! I have a similar website showing old (and some new) pictures of my old home town in the Netherlands.